In march we completed another internal demo with some important environmental milestones. The completion of this demo marked the completion of an entire planetary tile set. Check out our full post to see what kind of challenges await on the harsh desert planet of Elatu! Exciting news! We’ve created an entire planet! Well, a whole planet tile set anyway. Armour on the Wastes has two primary planetary settings. 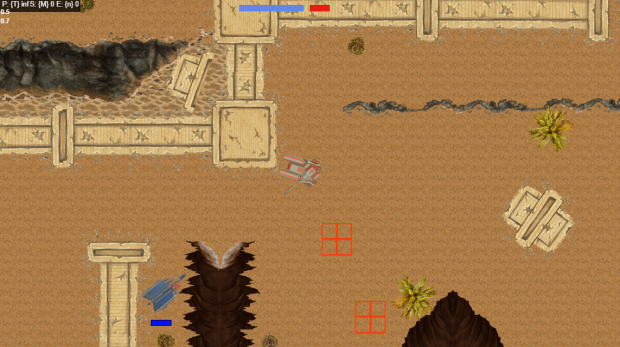 One of these, Elatu, is a desert world in which the player will often find him or herself battling over precious salvage materials. 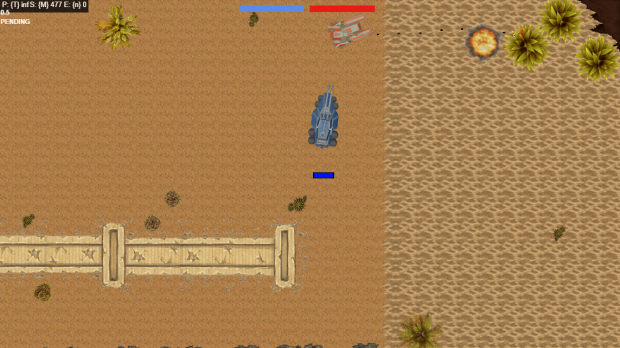 As you may have guessed from some of our art, we are big fans of tanks in the desert in space. Sounds fun right? It’s a totally hospitable environment in which absolutely nothing could go wrong. We still need to build out and design the levels we have sketched out for Elatu. But, we have the pieces in place now to make it happen. Following is an update on the features of our Elatu tile set, including some screenshot examples and notes on particular terrain features. Normal desert tile – If you are staring at the ground in the above screenshot, you are staring at our standard desert tile set. It may look simple, but this little monster took a lot of fine tuning from Wu-Gene to make sure that it doesn’t look overly repetitive. This terrain type is our standard terrain and presents no obstacles or movement penalties. Sand dunes tile – The more lightly colored, wavy ground that you see above is a sand dune. Sand dunes serve a couple of purposes. For one, they break things up visually. Second, sand dunes will have a very important tactical role. In particular, sand dunes will impose a movement penalty on tanks. Think quicksand. We aim to make this feature a double edged sword. It should pose a tactical danger to the player. After all, there’s nothing worse than being ambushed while your wheels are spinning in sand. But, it will also allow the player the opportunity to lure enemies into a trap and unleash silly amounts of firepower on them. And in the big picture, this is a design principle that we hope will run throughout the game: If something can be used against you, you can also use it against your enemies. Trees/Foliage – I know, trees don’t grow in deserts. But, we’re based out of Seattle, so we couldn’t in good conscience make a game without something green. Plus, desert planets can have the occasional jungle right? Practically speaking, trees will be treated as obstacles and will be used as another level design feature to encourage careful tactical thinking – nothing like a narrow, tree lined corridor with a blind corner to make you think twice about your health meter. Oh, and in case you were worried that we’ve become too eco-friendly, don’t worry. All foliage will be fully destructible – burn baby, burn. Chasms – You can’t have an inhospitable war torn desert planet without having some horrific chasms scarring the landscape. Chasms will serve many of the same purposes as walls. They will be obstacles that tanks must work around. However, one key difference is that tanks can shoot across chasms, making for some fun times for players that like to hang back and fight at range. Of course, if the player is up against a hover tank, then all bets are off. Walls – I mean, we had to have walls. After all, capturing an enemy base is not nearly as satisfying if it’s not fortified. Walls will be used in all sorts of configurations. We created many different wall tiles in all shapes and sizes so that we can build bases for days. We also created wall pieces that fit with the war torn desert vibe – kind of a solid, but worn Ancient Egyptian fortification feel. Walls will be treated as indestructible obstacles. While it’s fun to have some destructible terrain types, we also want to provide opportunities for players that prefer a highly maneuverable, finesse approach. Navigating a multi-layered wall base while taking fire from enemy turrets should provide a fun test of these players’ driving skills. Cliffs – Ah yes, cliffs. My favorite. It’s surprisingly hard to come up with cliff tiles that look natural in a top down 2d setting, but we were able to take some inspiration from some of the old Red Alert cliffs. As with the walls we have multiple types of cliff pieces in order to make different geographical configurations. In particular, Wu-Gene did a great job thinking through the cliff “end piece” tiles that are necessary in order to blend the end of a cliff into the normal ground. Without these, all cliffs would have to run on indefinitely across the whole map, which would be quite odd. We’re still fine tuning how cliffs will work in combat. As much as possible, we want to simulate the tactical advantage a tank would have in being on top of a cliff, which means tanks on the bottom of cliffs will likely have a limited ability to shoot up to the top. 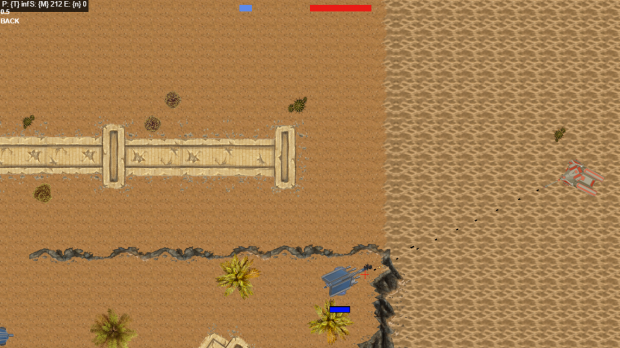 By now, we hope you can see yourself battling enemy armour across this rugged landscape. It does beg the question though – why desert? To be honest, it seems to have just arisen naturally as AOTW has developed. I think a big part of it though is that it fits with the gritty vibe that we feel is at the heart of AOTW. Another valid question might be – will this whole entire game take place on Elatu? Will there be any other sort of environment in which to unleash firepower?The short answer is, yes. There will be a different environment as well. But, it’s going to be much, much colder.